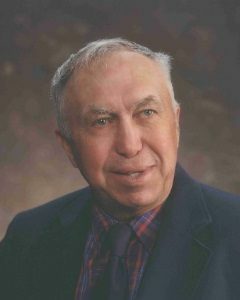 Ralph Novotny, age 86, of Hector, passed away Saturday, January 26, 2019, at the Renville County Hospital in Olivia, Minnesota. Funeral Service will be held Saturday, February 9, 2019, at 11:00 A.M. at First Lutheran Church in Hector, with interment in the Hector City Cemetery at a later date. Visitation will be held Friday, February 8, 2019, from 3:00 – 5:00 P.M. at the Hughes-Hantge Funeral Chapel in Hector, and will continue on Saturday at First Lutheran Church at 10:00 A.M., for one hour prior to the service. Ralph George Novotny was born May 25, 1932, in Willmar, Minnesota, the son of George and Edith (Freberg) Novotny. He was baptized on October 23, 1932, at the Church of Hope in Osceola Township. Ralph was raised on the family farm in Osceola Township, rural Hector. He received his education in country school District 90 and in Hector. He graduated with the Class of 1951 from the Hector High School. After graduation, Ralph worked in Minneapolis for several years at Armour Meats and also at a job painting hairdryers, all the while commuting home to farm. On July 3, 1960, Ralph was united in marriage to Marietta Rettig at St. Matthew’s Lutheran Church in Penn Township. Ralph and Marietta made their home on the family farm in Osceola Township, rural Hector. Ralph appreciated Marietta’s help working together in their farming operation with fieldwork and livestock. They raised two daughters, Margaret and Marjorie. Having been a lifelong resident of Osceola Township, Ralph and Marietta moved into Prairie View Assisted Living in Hector in 2015. Ralph moved into the Renvilla Health Center in Renville in January 2018. They had shared nearly 58 years of marriage when Marietta passed away in June of 2018. Ralph was proud to be a farmer his whole life, and was generally active in farm issues. He served on the Renville County Farm Bureau Board, MN Soybean Council, and the National Soybean Growers Association. He also served with the Renville County Health Services Foundation, Buffalo Creek Watershed, and on the BWSR Board. Ralph served as the District 1 Renville County Commissioner from 2000 to 2012. He represented Renville County as a commissioner on several committees including the Health Service Committee, the Lake Allie Environmental Service District, the Renville County Watershed Managers, the County Building Committee, the County Water Planning Committee, the County Extension Committee, County Housing and Economic Development Authority, Heartland Community Action Agency, Central MN Jobs and Training Services, CROW (Crow River Organizational Water Board), and the Joint Powers Water Board. He was a member of the First Evangelical Lutheran Church in Hector. Family, family history, and preserving history were important to Ralph. His many interests included reading, photography, bowling, fishing, threshing shows, flea markets, and touring museums. He belonged to the Minnesota Geological Society. He was on the board and a very active member of the Renville County Historical Society for decades. He enjoyed many driving vacations across the country, sight-seeing, and visiting relatives, as well as the annual family fishing trip. On Saturday, January 26, 2019, Ralph passed away at the Renville County Hospital following a brief illness. He had reached the age of 86 years. Blessed be his memory. Ralph was preceded in death by his Parents, George and Edith Novotny; Wife, Marietta; Parents-in-law, Walter and Helena Rettig; Sister, Doris Higgins and husband Robert; Brother, Glenn Novotny and wife Judy; Sisters-in-law Annasonia Rose and husband Ervin, and Janetta Augustine. Mike and Rhonda, Thank you very much for your kind sentiments and for thinking of us. Mike and Rhonda, Thank you very much for your kind sentiments, and for thinking of us. Our thoughts and prayers go out to all the family. He was truly a great person to talk to as he was very knowledge on a lot of matters. He always made time to visit with you about how things were going both for him and you. Heaven has received a very nice person. Our thoughts and prayers are with you during this difficult time. I/we will not be able to attend the funeral or visitation. May you find strength and comfort in knowing that others share your grief. It is hard to believe that the relative are fewer in number. Our thoughts and prayers are with you and your family, My husband knew Ralph through the Renville County Historical Society, such a nice man,God Bless.